The topic of Moonshine could easily fill a thick history book. There would be plenty of source material to choose from going back a few hundred years exploring the multiple facets of Moonshine’s rich heritage. Entire law enforcement agencies are devoted to regulating, monitoring and prosecuting illegal behavior resulting from the distillation, distribution and selling of moonshine. There are moonshiners operating today all over the United States that can claim membership to distilling traditions going back ten or more generations. So it’s pretty easy to say that there can be found a number of books and publications that explore this topic in detail. Rowley’s “Moonshine” is one such recent example. Odds are, everyone reading this knows about moonshine, or has an idea of what it is. You may have even tried it, who knows. But to establish everyone on the same page, moonshine is illegally distilled liquor that is also sold illegally. It is nicknamed moonshine because it was distilled and often transported by the light of the moon to evade detection. Here is what is unique about this book right off the bat: not only does the author give an obligatory history and introduction to moonshine, but he spends a significant portion of the book outright teaching you how to distill your own at home using supplies easily bought at brew shops or similar retail outlets. After a short disclaimer (present in the book as a necessity, probably) encouraging you to secure the proper licensing to distill, and at the same time warning that you probably won’t get one without serious financial effort and patience, Rowley gives a sly wink as he with astounding detail and ease shows you how to make moonshine on your own. Fascinating, but I can’t help but smirk while reading this and thinking how many readers will actually try to make Moonshine but have no real means of doing so legally. This book does not seem to be merely a historical account, a do it yourself instructional, a tourist like pamphlet touching on the basics, or merely an excuse to write lazily about a topic most people would be interested in without effort. Rowley has written what I think is a celebration of Moonshine’s incredible legacy and culture. Peppered throughout the book are humoristic vignettes featuring famous song lyrics involving moonshine, home recipes, pop culture references, small profiles of notable Shiners and the lawmen who labored to catch them (it is recorded that around 120 law enforcement officials, dubbed “Revenuers”, lost their lives in the pursuit of illicit moonshining during the 1930’s alone). These little tidbits are amusing and unique, making the reading of this book quite engaging for someone who knows nothing about the subject. However, Rowley pulls off making this seemingly simple book with plenty of graphics and jokes (I recall one page filled with perhaps 150 different words or phrases describing inebriation) relevant for a serious student of the subject. For example, Rowley details the process of making Moonshine all the way from malting, mashing and fermentation to distillation. He even includes insights on low wines, filtering and flavoring to name a few. One of the striking and perhaps most important sections of this book is Moonshine’s history. This isn’t the history of whiskey, for that goes back all the way to perhaps the 15th century. 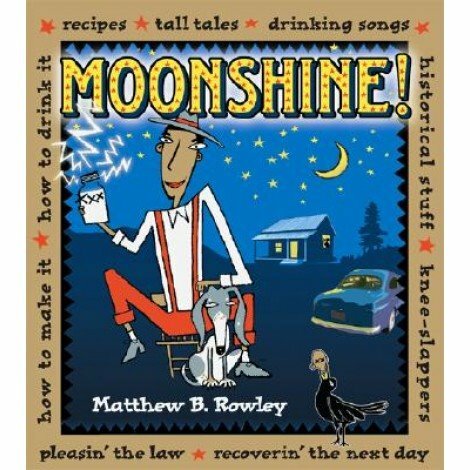 Rowley instead gives the reader Moonshine’s history, which is more connected and burned into the formation, history and governance of the United States than you might think. In fact, the vast majority of early farmers and settlers made their own whiskey from their excess harvest grains. Think about it. Would you rather haul 200-300 pounds of your crop across vast stretches of wilderness with no roads to the market, or would you carry a smaller supply of that grain distilled, which when you sold or bartered it, would produce much more profit? If you farmed you most likely distilled, and it became a part of your life and livelihood. Because of this, when the government began to tax the sale of liquor, eventually over 50% of the government’s revenue came from liquor sales. This tax hit whiskey makers very hard, especially those who bartered with whiskey, thus having no cash to associate with this sale. This became such a problem for farmers that 10,000 of them assembled against the government with arms in protest during the so called “Whiskey Rebellion.” This book is successful in relating the rich heritage of moonshine with the history of this country, something the history books neglect to inform us of. Moonshine was never required to be, well, good. In fact, much of it produced in the past as well as in the present is downright awful. There are a number of reasons, chief among them is greed. The cheaper one can make it for the most amount of profit is good enough. Some distillers were known to put bleach or acid in their shine to give it “kick.” Some Moonshine even caused paralysis, blindness, disorders and of course, death. Moonshine has been around long enough for plenty of Shiners to get good at it, and I’m sure they make some pretty good stuff, but this has always been primarily about money and profit. Because this tradition is illegal, the production and quality is not regulated; you can do whatever you want however often you want and your customers will buy it anyway (because at it’s heart, alcohol is a drug). My criticism is that because so much of this drink is pretty much poison produced merely for money, how much romantic sentiment can one pull out of moonshine’s culture? Rowley does not neglect in pointing out these facts, but he doesn’t put them in the proper context. How much can we enjoy something that is illegal to make and/or buy? The majority of moonshiners do not seem to care as much about what they do as Rowley does. He may be painting a touch too romantic and sentimental picture of moonshine while trying to perhaps gloss over the dark reputation that remains when the dust settles. But it sure was fun to read anyway. Would I try moonshine if I ever got the chance?